Villa Melia is situated in an elevated position giving it beautiful views of the Ionian Sea. Villa Melia is situated in an elevated position giving it beautiful views of the Ionian Sea. 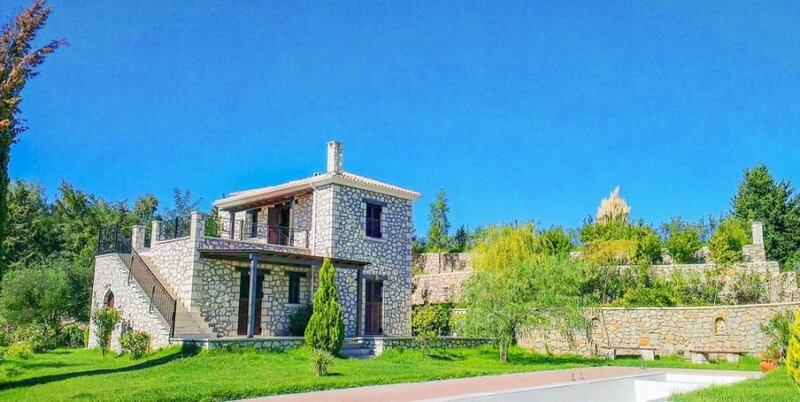 While the villas are peacefully located in the picturesque village of Spanochori they are still close to amenities being just ten minutes away from the town of Lefkada. The villa is part of a small complex of five villas. Inside, on the ground floor, the luxurious 2-bedroom villa boasts spacious open-plan living and dining accommodation with air conditioning and Wifi throughout. The fitted kitchen boasts granite surfaces and is fully equipped with all modern appliances. Also on this level is a bathroom and double bedroom. Upstairs, is the second double bedroom with patio doors leading onto a balcony and a further bathroom with Jacuzzi bath tub. Outside, there is plenty of space to enjoy, with a large garden and private swimming pool with separate children's pool area. There is also a veranda covered with a wooden pergola and comfortable furniture complete with barbecue making it the perfect place for alfresco dining.